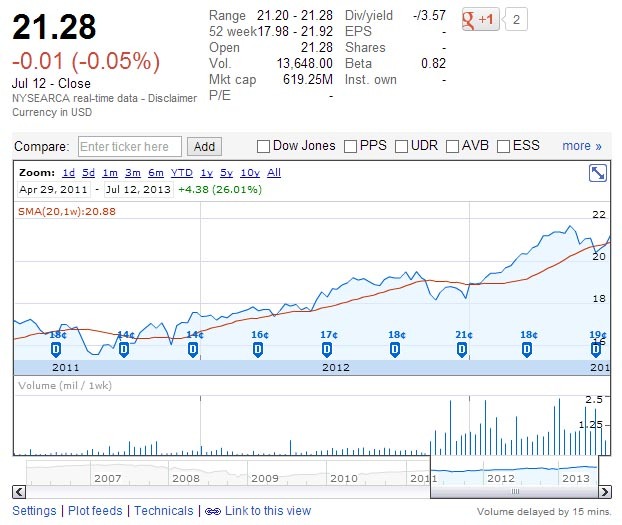 JDUy: TechWhet: Investing: How long do I need to hold a stock to earn the dividend? Investing: How long do I need to hold a stock to earn the dividend? Can I make "quick money" by investing with a high-yield dividend strategy? I'm fairly new to dividend investing as a strategy. Do not ask me about tax implications. There is no financial advice on this page. These are only my personal observations. Investing involves considerable risk, including loss of cash (and worst of all, loss of my cash). I am hardly the first person to think this is a good idea, and it's likely that others will be far out ahead of me. Most small-time investors (like me) understand the concept of buy low, sell high. But in uncertain times that's a hard game to play. And when someone doesn't have a lot to begin with, it is always uncertain times, right? But there is one way to make some money whether stocks and exchange-traded funds are going up or going down -- and that is to invest in equities that have dividends. Not all stocks/funds pay a dividend. And it seems that most that do, only pay in the 2% or less range. Still 2% is like 10 times more than the average American can get on any savings or checking account these days. The best CDs are only in the 3% range right now. That's crap. Piddling returns for poor people who want to stay poor! But, those tiny interest payments are guaranteed by the bank. With stocks, there's no such guarantee. So then, dividends make for an attractive incentive to own a stock or fund, especially if it is increasing in value at the same time. The amount of the dividend depends on several factors including the company's earnings, and the increase or decrease in the value of their stock on any given day. At a lower price, an equity could pay a 3% dividend yield; but if there were a modest jump in the price, the yield might drop to 2.5% or 2%. With a lot of money involved, plus sales commissions, that could make a huge difference. The one thing to know about dividends is this: The value of a stock or fund drops by the amount of the dividend being paid. So, if XZY closes at $12 on Wednesday, and it is set to pay a $1 dividend on Thursday, then the value of XZY will drop to $11 on Thursday morning. Dividends are not free money. The hope is that, over the next 3-month interval, the value of the equity builds back up again to where you bought it (or beyond), and the process repeats itself continually in your favor. The notion that one could profit from a one-day "flip" is not as easy as it might first appear. 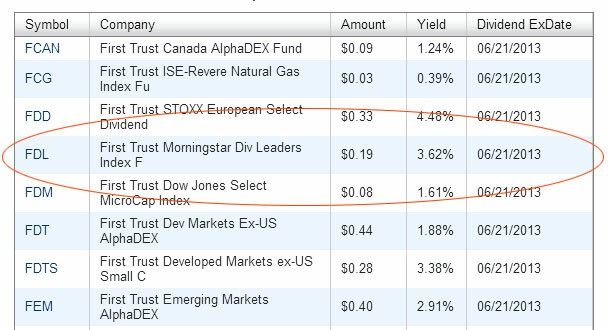 How do I know which stocks/ETFs pay a high-yield dividend? This is easy to find out. But it does involve research and doing calculations. Today, some of the highest paying funds are called MLPs (Master Limited Partnerships) and REITs (Real Estate Investment Trusts). Are they a sound investment? That depends, of course; and whatever I write here today is outdated tomorrow. So, it's best to be up to date by turning to sites with current database info. 1. 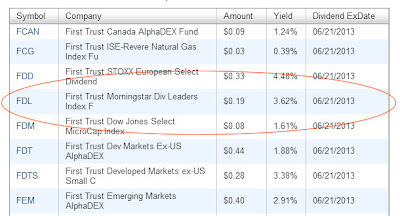 Find a site that lists high-yield funds. Anyone into investing, already knows the value of Yahoo! 's Finance section. Other good sites include Bloomberg, and Google Finance. At many sites like these, individual users can save a watch list of interesting investments. I prefer Yahoo for it's Interactive Chart which easily lets me check an option under Events > Dividends to see what the past pay outs have been. It shows the history of earnings, the frequency of those earnings, and layers that on top of a line chart that shows the value of the equity over time. However, usage does require some "hovering" skills, a scratch pad, and a calculator or spreadsheet to do comparisons. 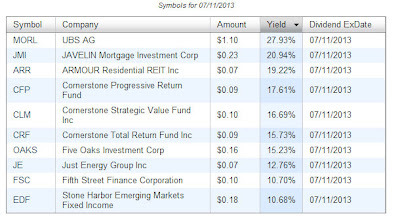 Look for this on the page of details: the "Yield" or "Dividend" or "Div/Yield." This is the percent that a stock or fund has earned over the past 12 months. Some equities pay every month, though, others pay only once per year. Neither of these is particularly bad, if you're investing in dividends, you'll probably be looking at the quarterly or annual pay outs, because the monthly payouts might not be worth the possible costs. 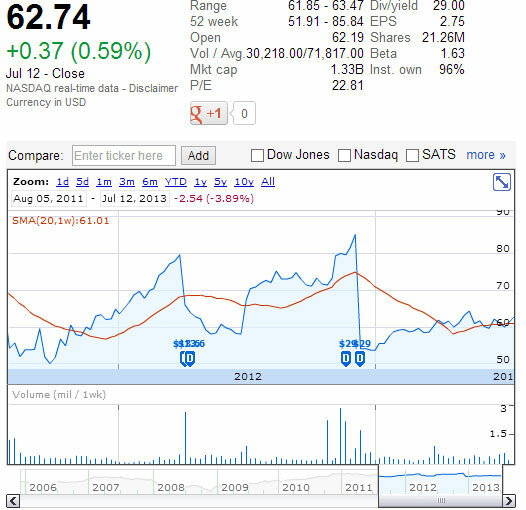 Sometimes equities skip over certain periods and do not pay any dividend due to issues inside the company. While doing analysis and data gathering, one may notice that the dividend can vary widely, especially with funds that pay monthly. This is because funds represent a group of businesses, and some of those businesses may pay monthly while others quarterly. The length between payouts and chosen dates are set by each fund -- there's no one consistent method involved. 3. Look up the "Dividend Calendar"
But even this wealth of information is not enough to make a perfect decision. Let's take a look at one astounding example of a high-yield stock: LORL (Loral Space and Communications, Inc). I have no idea what it is, or what it does, but the charts say it pays an amazing 46.5%.... 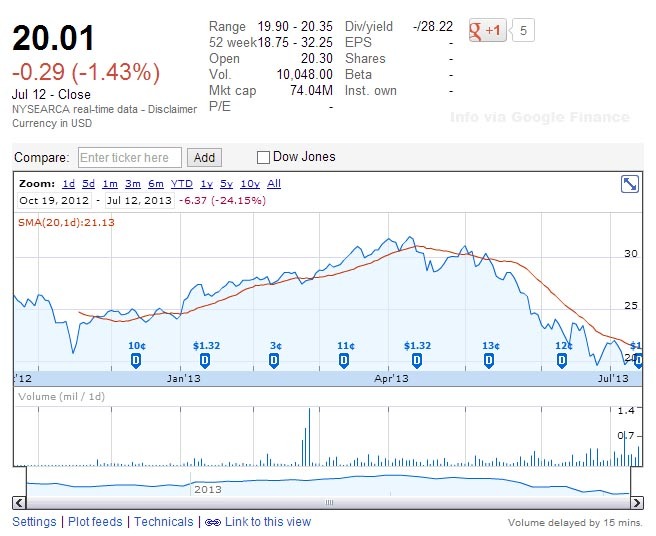 Hold on, let's look at this wild chart from Google. According to the data online, this entity paid its first dividends last year, though it has been listed for several years. Look at the dip after the dividend payouts -- $83 down to $54 in just one day. Wow, that seems like a 35% corresponding drop on the price that people may have paid just before the payout. And the payouts are at irregular dates -- two in April, one in November, one in December. It's all more than I can comprehend. The yield has been quite high over the past year: An astounding 28% according to this info from Google. That looks super! But if you look closely at the "ex-date" dividend markers, you'll see that the actual dividend varies as much as 98% -- from $0.03 to $1.32. As of this writing, the latest pay out was $1.104 on a value of $20.01 per share. That makes that particular dividend 5.52%. If I had $3,000 invested before the ex-date, I would have received $165.60 (3000*1.104) for my return. Look again closely at the value line. Its easy to notice that there tends to be a dip just after an ex-dividend date. From what I've read, this is caused by the pay out itself. By paying out part of the company's worth, in cash, back to investors, the company's worth is reduced by that total amount. Hence, a dip in the value. Also, investors might be taking profits out, or the market is bearish. The dividend varies widely, too. MORL pays every month, but for two months, the amount is rather modest, then on the third month, it's huge. Uh, duh.... Which is the best month to buy, then? Also, it's clear that the value of this equity has dropped a full third in the past 3 months, possibly due to fears that interest rates will rise and people will not take out mortgages if that happens. So, if the trend is quickly going down, is that a good buy or a bad buy? That's up to other people to decide for themselves. I'm so wrong so often. Plus, there's the commission. Buy for $9.99, then sell for $9.99, and that's $19.98 out of my profit -- a full 12% lost to the third-party trading company. And taxes -- I cannot even get into that. So, how long do I need to hold the stock or fund before I can sell it and get the dividend? I used to think, "Well, if an equity pays out quarterly, then you have to own it for three months or more to earn the dividend." Why? Because that's the way the world works, or that's the way banks work with CD,s right? According to what I've read, you only need to own the stock or fund one business day to earn the dividend. But this is not just any random day, it is a very specific day that has to do with the "ex-dividend date" (aka "ex" date) that I mentioned in #3 above. Essentially, you need to own the equity on THE DAY BEFORE the ex-dividend date. This sets it up to be included on the "record date," which is usually 3 days later, when qualified investors are considered eligible for the dividend. I have run through this process several times this month, and it worked out as expected. July 2 -- Declaration of intended dividend ($1.0485 per share). July 10 -- Bought 100 shares at $27.866. ($2,796.98 incl commission). July 12 -- Sold 100 shares at $27.4649 ($2,736.45 incl commission). July 15 -- Record Date. July 23 -- Pay Date ($104.85 received). July 23 -- Post-sale stock price: $28.43 (oops, definitely should have waited to sell). A whopping 1.6% increase from the original cost. Not all that impressive, is it? Oh, well, it's on the plus side. Had I put down $10,000 or $15,000, the weight of the commissions would have been lessened, but I could have lost big time, too. July 2 -- Declaration of intended dividend ($1.1045 per share). July 10 -- Bought 155 shares at $20.2065. ($3,142 incl commission). July 12 -- Sold 100 shares at $20.3601 ($3,145.77 incl commission). July 23 -- Pay Date ($171.20 received). July 23 -- Post-sale stock price: $20.58 (oops again). Cleared $174.97 or 5.5% more than the original cost. That's better, but rare. And as you can see, in both cases I would have made more if I held on. Unfortunately, I tried this in a third fund, OFS, and definitely will lose some money on that experiment. If I buy a stock or fund on the ex-dividend date, do I get the pay out? Nope. The ex-date is the first date that an investor is NOT qualified to receive that period's dividend. If I buy on the day before the ex-dividend date, do I get the pay out? Yes. I've done this three times and received the dividend. Do I need to hold the stock until the record date? Apparently not. From what I've read on various sites, you can sell the stock or fund on the ex-dividend date, and still receive the dividend. After testing the theory, I can say it did work as expected. How long before I get the dividend? The dividend is typically paid one or two weeks after the ex-dividend date. I've had some money invested in FDL for a while. It did well for me over the years. I thought maybe I'd invest some more, and take advantage of the upcoming dividend. Here it is on The Street's site. So, I threw a couple more thousand dollars at it on June 21, 2013, to see if I would get the dividend. June 21 was the exact WRONG day to put the money on because it is the ex-dividend date. I should have put the money on June 20, the day before, but because I was misinformed, I missed out. I only got the dividend on the money I already had invested on FDL, not on the money I just threw at it too late. DOH! So, now what? I'm looking at this chart, and FDL seems to go up and down with the general market. The DOW and S&P 500 just hit their highest highs of all time. Earning season is almost over, and most large quarterly dividends have come and gone. The return I get for the next three months depends on the value of the stock, and me selling it for more than I bought it. Do I hold onto this and ride it's rise? Do I sell it and wait for the inevitable dip? Do I sell it and reinvest it in something else? Because of the rise in value, the yield has shrunk -- should I be satisfied with 3.57% in dividends? the chosen equity investment is a fairly stable stock/fund. the overall stock market is bullish, not bearish, and it's not likely to drop dramatically in the immediate term. the yield (dividend/share price) is high, and the term is on the high end of monthly fluctuations. on $3,000+ this quarterly yield is at least 3%, and at $5,000+ at least 2.5%; so 10%/year or more. the commission doesn't eat the remaining pay out (plus taxes). the understanding is that a solid return is going to be MODEST unless tens of thousands is involved. there is a built-in likelihood that the stock's value will drop immediately -- perhaps as much as the percentage you just earned -- and the dividend profit must be higher than the drop. the investor has a strong stomach for greater losses if the value of the equity goes down due to market conditions. That's a lot of ifs. So, I don't plan on making much in the way of "quick money." Does it work? Yes. Is it better than picking a good stock and holding onto it? Hmm, probably not. If you buy and hold a solid, high-yield dividend stock or fund, you ought to get your money back eventually, in drips and drabs, regardless of any declines from the original value. How long that takes depends on the percentage being paid out. Thanks for sharing the information. This article will help the investors to making profit by from stock market.